A week ago we returned from a week in Split, Croatia, and I share here some of our food and wine experiences. This break was not particularly wine-focussed, and we did not visit any local producers, but we did drink wines made from local varieties with meals. I’ll kick off with three of our favourite restaurants, the first two being suggested by the owner of our rooms as places he likes to eat. Villa Spiza is just outside the Palace (the area in the centre of town where Diocletian’s Palace stood). They buy in fresh food every day, and as it starts to run out it they cross dishes off the menu, and close the restaurant when it has all gone. No reservations, so you have to just turn up and be prepared to queue for a table. When we were there we waited around 30 mins, but the queue soon grew to an hour. Both from the perspective of getting a good choice of dishes, and minimising queuing, it is perhaps best to go for lunch or an early evening meal. You will also have to accept that seating can be cramped. So what is so great about it? 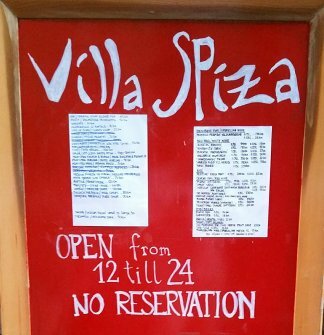 The food was simultaneously the best and the cheapest we found in Split, and although the staff were busy, they were also attentive and friendly. 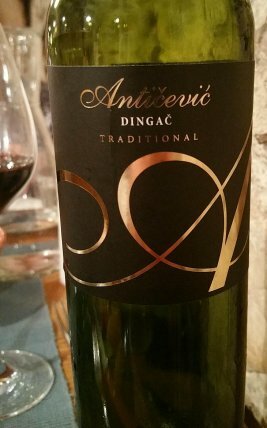 This is where we got the Dingač mentioned below, which we had with steak. It was served at room temperature (mid-to-high 20s Centigrade) but when I asked for a bucket of ice and water the bucket appeared unquestioningly, and within the minute of my asking. We only visited once because we did not feel like queuing on other occasions, wanting a more relaxing evening. 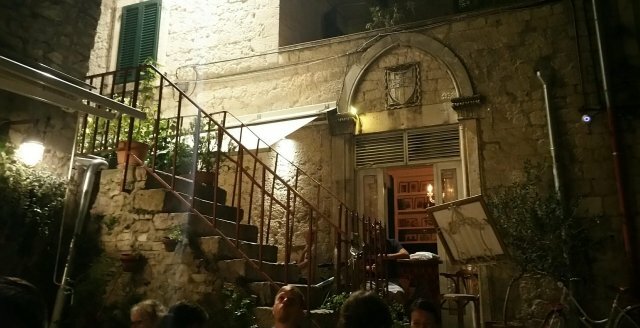 Konoba Fetivi is bit further out, but still only 10 or 15 mins walk from the Palace. Nothing fancy, but good quality food and reasonably priced, and we had two evening meals there. Best known for the fish and sea food, but they serve meat too. This is where we got the house white mentioned below. When we were there a couple of weeks ago, we needed to book to get in for dinner. Gallerija is actually in the Palace area, and a bit hidden away down a side alley from an already very narrow street, in a small courtyard. Good food at a decent price, with good service and a very pleasant location. We were staying so close to this place that we could use our rooms’ WiFi, so perhaps we were a bit biased, but we had dinner there twice, and a few breakfasts too. Not as busy at the other two places above, but probably still worth booking for dinner to be on the safe side. The image above is the view from the restaurant courtyard, towards the building where we stayed on the second floor. The above three restaurants I would recommend with confidence, but now for some other places you might be tempted by if you use the Internet to check out wine places in Split. Zinfandel had great service and food, but it was expensive, e.g. the steak was about twice the price it was in most places. And the hasselback potato on their menu to accompany the steak was not at all like a hasselback. Despite the price and the un-hasselback potato, I must admit we came away feeling we had a good experience, so if you are feeling flush maybe you should give it a try. In contrast, the lunch we had at Uje Oil was very disappointing considering the praise it seems to get online. There were many minor annoyances with the place and the service, which together gave a bad impression, and the food we ordered was average at best. Maybe we caught them on a bad day, but I can only report what we experienced, and we were not tempted to return. Booking was needed for both these two places also. In fact, on two occasions we tried booking Uje Oil around midday for dinner, and failed both times. Now, a couple of wines that made an impression in very different ways. Finally, a wine merchant. Looking online the best one in Split seemed to be Vinoteka Terra. It’s in a sort of courtyard just off the road prilaz braće Kaliterna, down some stairs, and in a cellar that it shares with a restaurant. The sign for the shop is a very small plate on the door, and easy to miss – the restaurant signs being a lot more prominent. The picture you might find on the Web, of an alcove with wine shelves, is the whole shop interior, and is not nearly as big as some online reviews make out. Nevertheless, it is still the best selection of Croatian wine I have seen in one place, taking up about half of the shop’s shelf space. Top marks for the help I was given by the lady in the shop in my quest to find 6 bottles to bring back in checked-in luggage. No idea how competitive the prices are for Split. This entry was posted in General and tagged croatia, restaurant. Bookmark the permalink.